Melanin production in animals has been associated to a number of advantages spanning from UV light protection to a better ability to camouflage or produce warning coloration patterns. The most commonly proposed hypothesis to explain such phenomenon is related to the better ability of darker individuals to absorb and retain heat, and is known as “thermal melanism”. The thermal melanism hypothesis is associated in particular to organisms with a limited ability to thermoregulate, as ectotherms, whose fitness is tightly dependent on climatic conditions. Ectotherms living in cold climates are expected to show a high degree of phenotypic plasticity in order to better adapt to stringent environmental conditions. In insects, melanin is not only related to the pigmentation of the surface of body parts, but is also released in the hemolymph as a key component of immune response. In fact, when the insect cuticle is breached via wounding or parasitism the phenoloxidase enzymatic pathway is activated and melanin is produced in order to neutralize foreign bodies entering the hemolymph. The activation of insect immunity, and in particular melanin production, has been shown to be a costly process, hence trade-offs between investment in immunity and other fitness-related traits can be expected when the conditions are not optimal. I wanted to test the thermal melanism hypothesis on the Glanville fritillary butterfly (Melitaea cinxia), for which the northernmost limit of its distribution range is located in the Åland islands. 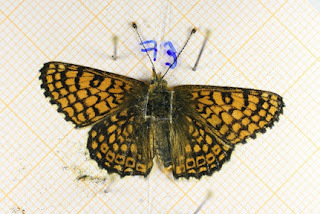 Adults of the Glanville fritillary are observed to fly actively in conditions of full sun and temperatures above 18-20°C. However, when temperatures are lower and the sun is absent they are incapable of moving and performing their activities. In addition, a great variation in the wing pigmentation has been described, hence they are expected to be plastic. To test the plasticity of wings, I have exposed pupae to either a cold or control treatment, took photographs of adult wings and measured their darkness in a series of experiments performed in the spring of 2015 and 2016 at the Lammi biological station. Furthermore, I was also interested in the connection between melanin allocation to wing patterns and the ability to produce melanin in the hemolymph as a key component of immunity. In order to test this, I collected hemolymph samples of control and previously cold exposed adults and measured the activity of the phenoloxidase enzyme. Finally, to test the costs associated to melanin production I infected control and cold exposed butterflies with a bacterial solution, and assessed lifespan. Preliminary data show that cold exposed pupae resulted in adults with darker wings, indicating that they are able to modulate melanin allocation to wings in response to thermal conditions. In addition, exposure of pupae to a milder cold treatment still resulted in darker adults, but only in females, which in standard conditions are paler than males. This indicates that wings of the Glanville fritillary are highly plastic, and potentially supports the thermal melanism hypothesis. Contrary to my expectations, the production of phenoloxidase in the hemolymph was higher in adults that had been exposed to the cold conditions, suggesting that there is no trade-off in the allocation of melanin between wing patterns and immune defense. Moreover, the condition of females seemed not to be affected by cold nor bacterial infection, since the lifespan data did not significantly differ among treatment groups. Males showed a similar response, except for the ones that experienced both cold exposure and bacterial infection, for which we observe a significantly lower lifespan. Based on these data, the upregulated phenoloxidase production of cold exposed individuals did not seem to improve the ability to survive or fight infections, but instead it seems associated to a lifespan cost in males. In order to elucidate the adaptive value of darker butterflies, and demonstrate or reject the thermal melanism hypothesis, I carried out another experiment in a large outdoor enclosure at the Lammi biological station in summer 2016. I measured traits as heat absorption capacity with a thermal image camera, as well as flight ability and reproductive success of cold exposed butterflies to pinpoint potential advantages in terms of dispersal or fitness traits. I am looking forward to the exciting results!